Yes, it’s Grand National Day again on Saturday as Aintree hosts the 172nd renewal of the historic race that engrosses a nation. Irish trainer Gordon Elliott, who saddles no fewer than 11 of the runners in Saturday's big race. (PHOTO BY: Alan Crowhurst/Getty Images). Boasting a total of £3.2 million in prize money, the extravaganza kicked off with four Grade Ones on Thursday and maintains its rich quality throughout. Few courses in the country are run better than Aintree, and few boast the kind of heady atmosphere that Aintree generates, thanks largely to the unbridled enthusiasm of the Liverpool locals. 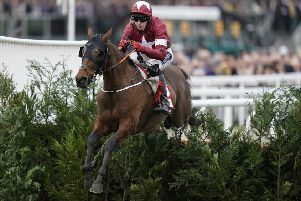 This year’s National revolves around one horse, last year’s winner TIGER ROLL, who is bidding to become the first since the mighty Red Rum in the 1970s to win back-to-back renewals. Many will not hear of defeat for the nimble-jumping, smooth-travelling 9yo, but he is 9lb higher in the handicap than last year when, it must be remembered, his stamina very nearly gave way on the long run-in. It was also a very ordinary National in 2018, while this year’s race looks richly competitive and packed with strength in depth. Tiger Roll is one of no fewer than 11 runners from the Gordon Elliott stable. It was due to be 13, but two of them, Don Poli and Outlander, were sold at auction on Thursday night. His Irish compatriot, Willie Mullins, saddles four, and half the field is travelling over from the country responsible for eight winners in the last 20 years. Elliott, like Nigel Twiston-Davies, is also aiming to join an elite band of only seven trainers to saddle three National victors, while octogenarian Trevor Hemmings is aiming to become the first owner to lead in the winner of the race four times. He is up against the Gigginstown House Stud, run by Michael O’Leary, of Ryanair fame, which is responsible for seven of tomorrow’s runners, including Tiger Roll. In the plate, Ruby Walsh is gunning to become only the seventh rider to boot home three National heroes. And in the absence of injured crowd-pleaser Byrony Frost, both Lizzie Kelly and Rachael Blackmore are bidding to make history as the first woman to ride the winner. My views on their individual chances can be found in my Pinsticker’s Guide, so all you need now are selections! Two years ago, I was lucky enough to tip One For Arthur at 40/1 two months before the race. Last year, my first choice was Pleasant Compnay, who was beaten just a head at 25/1. I can’t promise to scale such heady heights for a third year running. But here’s my six against the field, with an enticing outsider thrown in as well.